While great design today requires the most sought-after fabrics, hardware and furniture—and involves progressive application of the most cutting-edge tools, interior design talent, installation and project management—business at Decorators Factory Outlet is still conducted the old fashioned way. For more than 50 years, our family-owned and operated company has consistently offered designers the newest tools of the trade, work space and advice available. Over three generations, Decorators Factory Outlet has grown from an upholsterer and furniture maker to a full-service interior design facility, yet having always maintained our “business on a handshake” attitude. Our customers are at the heart of our firm, and at Decorators Factory Outlet, we strive to create and maintain personal relationships with the area’s top designers. At Decorators Factory Outlet, we can fully manage or assist you with the design of bedrooms, living rooms, family rooms, great rooms, dens, kitchens, bathrooms, dining rooms, home offices, hobby rooms, and more. At Decorators Factory Outlet, we use the industry gold standard in computer-aided design: Minutes Matter Studio graphic design software. This cutting-edge software helps you deliver stunning design while facilitating communication between you and your client. Minutes Matter considers every conceivable aspect of the design, drilling down from the obvious style considerations to the light source and angles, privacy, energy efficiency and more. Using computer-aided design, we take interior design to a whole new level that allows both the client and designer to express their utmost creativity within a highly functional design for any room in the home. For more about this incredible technology, see http://www.minutesmatter.com/. 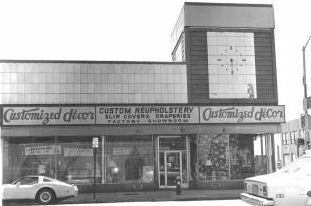 Our original family-owned and operated Decorators Factory Outlet location.